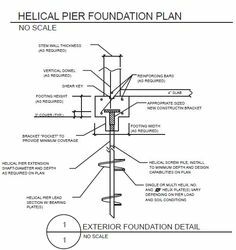 Foundation Masters, Engineers Designs Helical Piers for other Engineers, Architects and Contractors in the State of Florida. We are the best Helical Pier manufacture, and sales expert in Florida. Foundation Masters will beat any of our competitors price by 5% GUARANTEED or your order is FREE. A Helical Pier or Helical Pile, are a deep foundation system designed to support loads in weak soil conditions. The Helical Pier design is very simple, helical bearing plates are cut from 3/8″ or 1/2″ flat steal plate and formed into the shape similar to a screw thread then welded to a long shaft, then hot dipped galvanized. Helical Piers can be made with a number of Helicals on one shaft segment, and any size pipe or square tube. Helical Piers can be driven to any depth from 5′ to 200′ deep, by adding segments or sections that are connected with couplings and grade #8 bolts. Helical Piers are a great choice if bad soil conditions are present. Helical Piers will protect the structure against heavy clay soil that will shrink (downward settlement) in the dry season and expand (up lift/heaving presser) in the wet season. Helical piers are a great choice for coastal construction as long as the helical pier is hot dipped galvanized and grout filled with a high fly ash mixed grout.